A dental extraction is the removal of a tooth. There are a couple reasons why extractions might be needed. 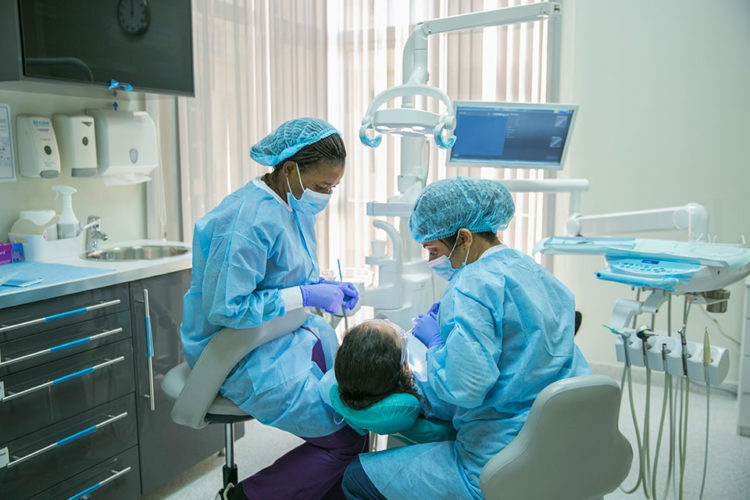 Extractions are performed for a wide variety of reasons, including tooth decay that has destroyed enough tooth structure to render the tooth non-restorable. The upper portion of the tooth (the crown) has penetrated through the bone, but the gingiva (gum) is covering part or all of the tooth’s crown and has not positioned properly around the tooth. The tooth has partially erupted, but a portion of the crown remains submerged below the gum and surrounding jawbone. The canine, or eye tooth, normally erupts into the mouth between the ages of 11 and 13. Sometimes one or both canines develop in the wrong position. Often they lie across the roof of the mouth behind the front teeth. If left alone the tooth will not erupt normally and may either damage the roots of the front teeth or push them out of position. Once the canine is exposed a small bracket is glued to the tooth. Attached to this is a chain which your orthodontist can then use to pull the tooth into the right position. The chain is usually stitched out of the way but it is quite delicate and therefore it is important to be careful when eating for the first few weeks after surgery. When frenum is attached high or between two upper front teeth, early removal can improve space closure of the front teeth. There is very little post-operative pain and swelling, and the patient can have normal function of the lips and tongue. Many patients hardly notice the effects of the surgery. Oral cysts can be found in the jawbone, or in soft tissues such as the salivary glands, skin or inside the mouth. A cyst is not cancerous but can damage your soft tissue. As the cyst develops, the bone structure around the tooth will feel an extreme amount of pressure. It could eat away from the bone and weaken it. An oral surgeon usually does this procedure under local anesthesia. If the cyst is infected, you may be given antibiotics.